There is always something special about playing a course that has been a regular stop on the PGA Tour. One would expect top conditions, great practice facilities, and an atmosphere of respect for the traditions and culture of this humbling game. 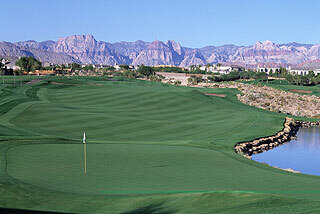 All this and more are present at the TPC Las Vegas in Summerlin. Included with the (high end) green fees are complimentary practice balls on a spacious grass practice facility, as well as use of a short game area with bunkers, grass areas for chipping, and a huge putting green. The golf shop features top of the line PGA quality apparel and golf equipment, and the locker rooms and hallways are full with memorabilia commemorating player's achievements and past tour events. A wonderful dining area with lounge and a huge picture window offer great views and a warm atmosphere to relax and unwind after a rewarding round. If you are fortunate, you may catch a glimpse of one of many tour pros who frequent the TPC as a means to tune their games. In any case, you can count on a friendly welcome and excellent service from the entire staff - from head pro to the course advisors and cart attendants whose purpose it is to help you enjoy a special experience at the TPC. We played our round on a gorgeous, late February afternoon, wondering all along if there would be enough time to finish 18 holes. On a busy day in the middle of the prime season, our foursome was able to complete the course in less than four hours, just beating a wonderful sunset. 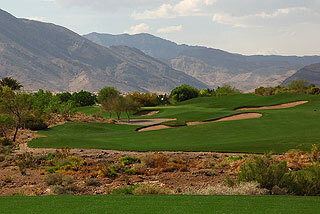 Though challenging, the TPC Las Vegas is playable to all levels of golfers, with a slope rating ranging from 136 from the tips to126 from the whites. A much appreciated feature are the yardage markers on the cart paths, along with sprinkler heads marked to the front/middle/back of the green, and a very visible 150 yard stake in the middle of the fairways. With each tee box providing yardage measured to the center of the green, and pin placement info on each scorecard, the TPC is a model of how public courses can be efficient in providing the necessary information to speed up play and make golf more enjoyable for everyone. A "local" rule also allows for a free drop from certain waste areas - further enhancing the course's playability. The greens were consistent and of medium speed, with mild undulations on most holes. 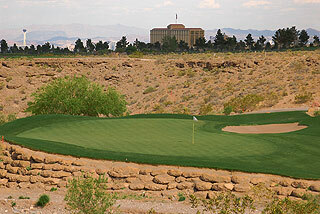 As with most Vegas area courses, you will do well to remember that putts will generally break towards the strip. When playing from the Whites, as we did, you will encounter only 1 par four over 400 yards in length. The challenge on many of the holes is the elevated green complexes, usually flanked by deep bunkers with rolling grass swales along the circumference. Fringe putting and low running chips are often easier to play than high pitches, as the grass is kept quite short, providing a lot of bounce on sand wedge shots. Bump it to the edge of the green and let it roll..If only we could heed our own advice. The course opens with a dogleg right par four with fairway bunkers short right and long left. This short hole can give you some confidence if you land your tee shot on a flat section of the fairway. From an elevated tee, you will have to negotiate the brick wall running along the front of the green, or bail out to the right on the mid length par three 2nd. Too long or too short mean trouble. The par four third presents a tight tee shot and a narrow approach, with a ravine left and mounding to the right. This is the number 1 handicap on the course. 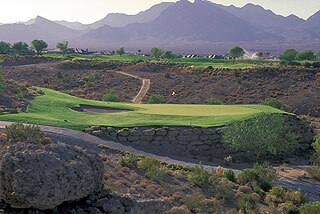 A reachable par five is followed by a short par 4 over a desert ravine. Avoid the waste area on the left and the fairway bunkers all down the right side, and this could be a good birdie opportunity. The sixth is a long par five playing to a huge green with a beautiful mountain backdrop. It is imperative to score well on this three-hole sequence, which are all low handicaps. The seventh is a par three over a wash, with a lot of room for error to the right. The 8th is a par four that will play long. It is open off the tee but narrows on he approach. At 309 yards from the white tees, the ninth seems like an easy closing hole. It's ranking as the fifth handicap comes entirely from the challenging green complex, with deep bunkers in front and mounds and swales surrounding the putting surface. The safe play is to the right side of the fairway on the par four 10th. Mesquite trees right and a waste area left will influence your tee shot, and the fairway narrows as you approach the green. The challenge on the tough eleventh is the uphill nature from tee to green, with a large, deep green-side bunker forcing a carried approach. 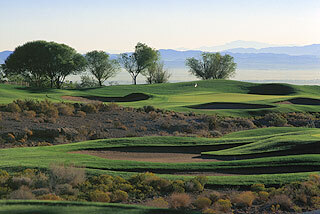 The twelfth is the shortest par three of the layout, and is nearly all carry over a desert ravine. If the pin placement is left, this hole plays considerably tougher. The putting surface is extremely undulating on that side. 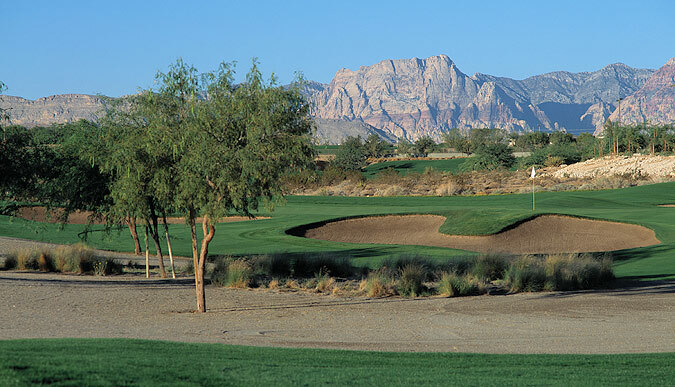 Numbers 13 and 14 are considered to be 2 of the toughest holes in the west. A deep ravine right on thirteen is intimidating off the tee, especially to right handed fade hitters. Fourteen demands a long uphill carry over a step ravine. This is a relatively blind tee shot - with the church steeple in the background as the recommended target. The approach must carry a narrow wash about 5 yards from the edge of the green. The 15th looks pretty open, but a ravine running all the way to the green on the right side will challenge your approach. A desert wash on the right side is all that is in the way of a good birdie/par opportunity on the par three 16th. This is followed by relatively long par four featuring a fairway that drops off considerably about 160 yards from the green. Desert area left and right at the 130-yard marker narrows the fairway considerably for long hitters. At 421 yards from the white tees, the closing hole is the longest par four on the course. Your tee shot will carry long as it runs downhill. Water left and fairway bunkers right make this a tight and demanding approach, and one of the prettiest holes of the layout. There is considerable variety in this layout, which incorporates its barrancas, arroyos and other desert features in a natural setting. The TPC Las Vegas has been recognized for its environmental excellence through its designation as a Certified Audubon Cooperative Sanctuary by the Audubon Cooperative Sanctuary System. 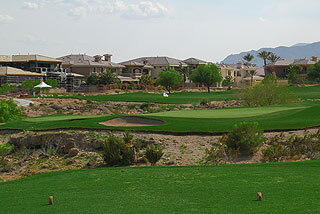 It is part of the nation's largest master-planned community in Summerlin, where you can find an abundance of high quality golf experiences and wonderful accommodations. 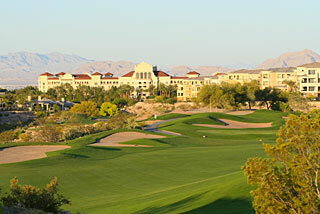 Upscale is in vogue here - and the TPC Las Vegas is a great example. 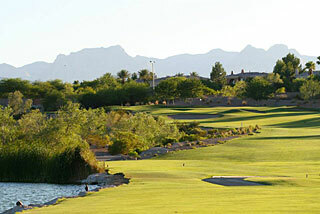 View the Two Guys Who Golf Detailed Listing Page for this course with a link to its website, click here.